P3DO stands for Photo 3D Organizer. P3DO is a multimedia tool for viewing and managing your CG assets,	3D Objects, 3D Animations, Digital Pictures	with a simple, intuitive, Explorer-ish thumbnailed interface. P3DO is also a major Poser 3D & Daz Studio library manager with many time saving and exclusive helpers. Also unique for Carrara & Quidam. Reliable, constantly maintained and enhanced for more than 18 years, P3DO is the solution to manage your CG assets. Select actors in a Pose allowing partial Poses, ignore BODY moves. For Poses, Hands, Faces, Materials, INJ. Including Posing form ZIPs. more about Open Partial Pose. Poser dedicated unzipper with thumbnails. ZipInstaller will fix errors in ZIP paths. Exclusive editor to customize Carrara thumbnails. more about P3DO for Carrara. BVH Movies & Poser Poses	animation viewer. 3D viewer for PZ3, CR2, Props and Hair. Preview images and textured 3D scenes before unzipping. The purpose is to manage all the digital assets related to 3D graphics	(3D Files, Textures, Pictures,...). Poser is the main 3D software addressed and many P3DO pro features are Poser oriented. However as a browser alone, P3DO is much more than a Poser software. PoserPython:	open files in Poser from Windows. Scene Manager: does the same with individual and is also able to delete them from disk. Librarian:	scan Poser Runtimes content and report all the oddities in a cute Html report. ZipInstaller:	install a Poser file and its dependencies from a Zip. PoserFavorite:	generate P3DO Favorites for you from Poser structure. Rsr2Png: our award	winning Poser4 to Poser5+ free pictures converter. Poser Figure identifier: detect the Poser Figure a cloth	belongs to. 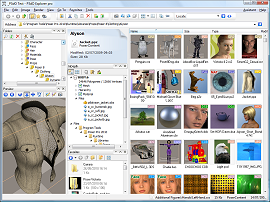 Morph Manager (free): Manage Morphs in Figure files. 3D viewer: with 38+ 3D formats. ZIP, RAR, 7Z, GZIP: All 3D formats (including Poser) can	be viewed when compressed. OBJ converter: ability to convert all 3D formats to	Wavefront OBJ. 3D animation: support for BVH	3D character animation with the	animation viewer. Image viewer: with 40 pictures formats. ZIP & RAR: most pictures formats can be viewed	when compressed (ZIP, RAR). Extra Thumbnails: will show ZIP, RAR with thumbnails	taken from picture in the archive (btw thumbnails for Shortcuts too). All 3D formats can be viewed from archives including	texturing. Pictures can be zoomed from archives. Windows Explorer compatible: support for Copy/Paste,	Drag and Drop, Shell context menu,... P3DO is an almost complete Explorer. Find / Search dialog: similar to Windows XP search companion. Subfolder Exploration: browse several directories at a time.